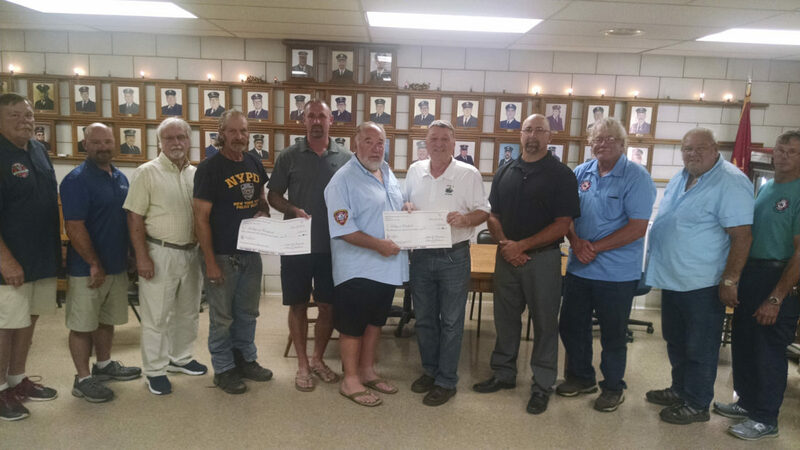 Members of the Westfield Exempt Volunteer Firemen’s Association gathered recently at the Westfield Fire Hall to present donation checks to members of the Westfield Village Board. A total of $12,500 was donated to the Village of Westfield from funds that were raised through the Westfield Exempt’s Annual Fund Drive and this year’s Ox Roast in Ottaway Park. Of the $12,500 donated, five thousand dollars will be transferred to the department’s equipment fund to purchase additional equipment for the Fire Department as identified by the department’s line officers. Another $5,000 will be transferred to the Special Equipment Fund for additional safety and extraction equipment for the new heavy rescue truck. The remaining $2,500 will be transferred to the Fire Hall Reserve Fund to be used to offset engineering costs for renovations to the Fire Hall restrooms to bring them into ADA compliance. Checks were presented by Exempt President Alan Holbrook to Mayor Mike Vandevelde and Exempt Vice-President Herb Johnson to Trustee Robert Cochran, while Trustees Dennis Lutes and Mike Catalano joined members of the Westfield Exempt Volunteer Firemen’s Association at the presentation. The Westfield Exempt Volunteer Firemen’s Association thanks all those who donated to their annual fund drive, as well as those who attended this year’s Ox Roast. Through your financial support our Volunteer Fire Department can receive the equipment it needs for our firefighters to do their job safely.